Stephanie grew up in the fast paced Bay Area before relocating to the Central Coast in 2009. She enjoyed spending her free time exploring the diverse areas that San Luis Obispo County had to offer. Stephanie quickly fell in love with Paso Robles and the surrounding communities. She knew it was where she wanted to call home, raise her young family, and start her career in real estate. Stephanie continues to enjoy spending her free time attending local events, trying new restaurants, and visiting the local ranches and vineyards. Stephanie is highly motivated and dedicated to helping her clients sell their existing home, or find their perfect house to call home. Stephanie is a proud supporter of military veterans, law enforcement, fire fighters, and teachers. 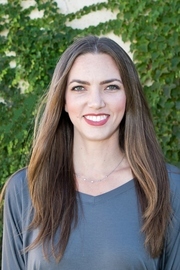 Stephanie is eager to help you every step of the way in your next real estate transaction.